Almond milk, soygurt, fermented cashew cheese… all these dairy imposters and others are slowly taking over the refrigerated food section. Whatever happened to squeezing a cow's teat and making do with the pale, white fluid that oozes out? It's like consumers today think they're too good to suckle at a bovine udder or something. Or maybe they're onto something -- that drinking cow milk is a little unnatural. Of course, just because something is unnatural doesn't mean it's bad, points out Dr. Michael Greger, a physician, author, and prominent vegan. "Wearing shoes is unnatural," he says. "Lots of things are unnatural, but we should look deeper if we're doing something that's a little strange, to make sure it doesn't cause negative effects." With that in mind, let's see what happens when you give up on cheese and its creamy ilk. 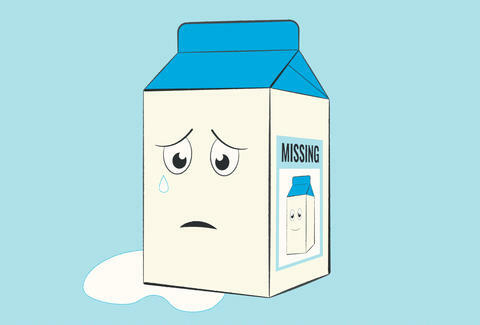 A meta-analysis shows that milk consumption is a risk factor for prostate cancer, the second-most common cancer in men. In some ways, it makes sense, since even organic milk is naturally full of hormones, which help both calves and tumors get bigger. "Drinking milk boosts IGF-1, a cancer-promoting growth hormone," Dr. Greger says. "It's a bioactive growth fluid that does what it is designed to do: put a few hundred pounds on a calf. So maybe we shouldn't be surprised that drinking milk from a massive species has these effects on our own bodies." Almond milk, by the way, suppressed the growth of cancer cells by 30%. And it keeps longer in the fridge, too. "But, but, but… calcium!" That's what people scream at you when you tell them to quit dairy, right? Right?! Yeah, milk has calcium. It also has saturated fat, cholesterol, and hormones. "There's calcium in dairy, there's protein in pork and iron in beef, but food is a package deal," Dr. Greger points out. "You can't say, 'I would like the burger, but hold the saturated fat and growth hormones. And that's the baggage that comes with dairy." Plus, the calcium that's in dairy isn't easy for our bodies to absorb; only 31% of calcium in milk is absorbed, compared to 60-70% of calcium in foods like sesame seeds, Dr. Greger says. Double down on the tahini, in other words. Kale, almonds, collard greens, and other foods have calcium levels that are equivalent or superior to what you'll find in dairy products. Plus, they have tons of fiber, which you probably need anyway. "Ninety-seven percent of people don't reach their minimum daily fiber intake," Dr. Greger says. "Dairy and animal products have no fiber. Getting calcium from vegetables, you get fiber, folates, antioxidants -- all the things missing from dairy that we could use more of." The only catch is that you have to actually eat collard greens and kale to get that calcium. "If they rot in your crisper drawer, the absorption rate is zero," Dr. Greger points out. Eat your greens, people. A big cohort study that followed more than 100,000 Swedish men and women for 20 years showed that the women who drank the most milk had the most hip fractures. "More milk was associated with more fractures, higher rates of cancer, heart disease, and a higher total mortality -- meaning they lived shorter lives," Dr. Greger says. "Men also had higher rates of death." Did you know cow farts (aka methane) contribute to global warming? It's such a big deal that California recently enacted regulations to stem the tide of greenhouse gases that originate in bovine butts. That's not even counting all the energy it takes to feed and water the livestock. If you want to fight climate change (which, in case you haven't been keeping up on things, is a big deal), you could swap your car for a bike. But you could also just skip the gallon of 2% and grab a carton of plant-based milk instead. It's a baby step in the right direction… which is a step away from drinking stuff made for actual babies. Missy Wilkinson used to disguise the taste of cow milk with chocolate syrup. Then she realized she could just stop drinking it entirely. Follow her on Twitter @missy_wilkinson and Instagram @nowlistenmissy.